First off, let me come out quickly as a Chromebook fan. 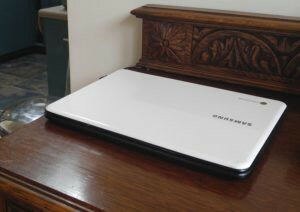 In 2011 I bought this pictured Samsung Series 5 3G 12.1 inch for $476.33. Nowadays, it is relegated to a recipe finder because it is just a little too slow for anything else. The battery charger broke down a couple of years back, but that is the only problem I have ever had with it. I wish my old UK school had gone with Chromebooks and Google Classroom. Instead they bought into Apple. I think that Apple is great for a school’s marketing image, but not a great way to go in the classroom. In my opinion Apple is gated (only Apple apps can be used), hard to administer and extremely expensive, though of course kids love it because it’s like owning Nike or Adidas over Shaq (Walmart’s own brand sneakers). The major benefit for schools using Chromebooks is that updating software pretty much takes care of itself provided the units are rebooted every now and again. If a school buys via Google edu they offer a $30 management yearly license enabling central management of devices. The benefits of centralized administration of devices cannot be underestimated. 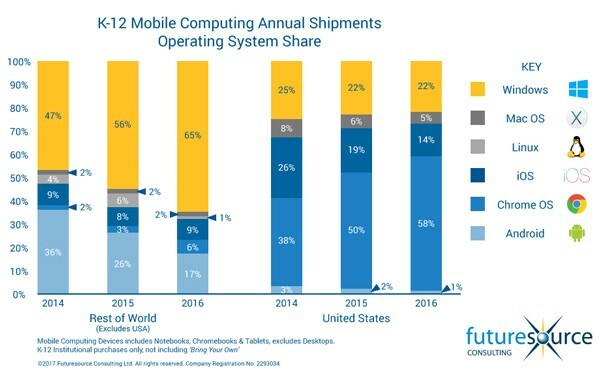 The graphic below from Futuresource consulting demonstrates just how quickly Chromebooks have taken over the K12 market. If I had to buy a Chromebook today there is a lot more choice than I had in 2011 and when I started looking at the choice of 42 different models on the google education portal I realized that if I was a parent or looking to choose one for my students, I would have a difficult time knowing what to pick. This article aims to help by asking some fundamental questions. The prices are taken from the Find Yours Chromebook page and they are similar to those on the edu.google.com devices page. 1) How much or little do you want to spend? If money doesn’t matter that much, then the Asus Chromebook Flip C302 ($449) or Samsung Chromebook Pro ($549) are top choices. At the other end of the scale, the Lenovo N23 also has a touch screen and converts, but comes in at an affordable $179. However, the N23 has similar other specs to my first Chromebook, 2GB Ram and 16 GB drive compared to the C302 with 4GB RAM and a 64GB drive. 2) Is your child’s computer going to fall off the desk or be subjected to fidgety fingers? When I was responsible for the upkeep of about 500 laptops at a school, one of the most irritating things that would go wrong with them was the “hilarious” way that students would pry off the key caps and move them around on the keyboard — or at least attempt to — thereby rendering the laptops out of action until an engineer got around to replacing the springs underneath and reseating the keys. In the classroom computers tend to get dragged around, dropped on field trips and generally abused beyond your wildest imagination. So it’s a good idea to aim for a set that can withstand both mischievous children and gravity’s hard knocks. Lenovo have thought hard about users in this environment and their N23 boasts anti-peel keys, has a non-slip texture and is “drop-resistant”. Dell’s Chromebook 11 ($219) is similarly designed to withstand the backpack environment with a rubberized trim and fully sealed keyboard. Given the choice of having to recharge during the day or not having to recharge during the day, this is a no-brainer. Laptop trolleys are great at night, but why on earth would we choose to have students plug their devices in during the day? In CNET’s tests, the Acer Chromebook family performed well with the aforementioned C302 coming in at 9th place and lasted for 9 hours. The Acer R13 ($399) was in first place with impressive 13 hour staying power. But all Chromebooks have a long battery life, certainly longer than most laptops. 4) Long bus rides — homework opportunity lost? Some school buses now have WIFI — we can but hope that this will become as normal as teens with smartphones (90%) — but until that happens the option to work offline might be important to you. Bear in mind that it is simple to link your child’s Chromebook to their phone’s hotspot connection if you have a good unlimited data plan. Aside from these “if only wishes made it so” fantasies, the important thing to look for here is the space to store those apps that will help your kids work when offline. Aside from Google docs, Google Keep and Gmail there are a plethora of apps that can now work without an internet connection and will automatically sync up to the cloud as soon as connection is restored, some will require some pre-planning if continuing work on a previously stored piece of work. By the way, this is one of the reasons that I like “bring your own device” policies — because kids have to learn to manage their own work and devices. Storage is probably the biggest difference that affects the price point. 16GB is only going offer 10GB usable space, after system software has eaten its chunk of storage. The computers mentioned earlier that fall into this category are the Dell Chromebook 11 and the Lenovo N23. 32GB is available on the Samsung Chromebook Pro and Acer R13. The Asus C302 comes with 64GB making it the outright winner in this category. A hybrid is a computer that can be used as a laptop and then reconfigured (turned) into a tablet. Generally they will have smaller screens and be lighter too. They also tend to be more expensive. Except for Lenovo whose N23 hybrid is around the $273 mark. Most of the options chosen earlier were from this small group (of 8 instead of 42). The value in being able to use a finger (or stylus in the case of the Acer Spin 11 or Asus C213 — both coming in around $350) to write and make notes, marks on documents will be very helpful especially when doing maths and science notation. I hope this article has been helpful. I know writing it has made me want to go out and replace my old model with one of these new bits of gorgeous technologies. I didn’t discuss cameras and microphones — a purposeful omission. These are great, are often used for fun projects in the classroom, and although they are often the most requested feature, they are not necessarily the most important. If you know your children need to do lots of multimedia projects, then this is an additional criteria to bear in mind. Finally, if I could go shopping today, I would probably pick one of the Lenovo N23s, mostly because I’m a bit of a Lenovo fan and I like spending as little money as possible… however, the C302 is very tempting indeed. Originally published at edtechs info blog. Opinionated ed-technologist, sometimes gamer, occasionally a little grumpy. Find me all over the place but at the moment I am reflecting on my book collection.